» How to run a macro using a button in Word 2016? Couple of days ago we learnt how to develop new macros in Microsoft Word 2016. 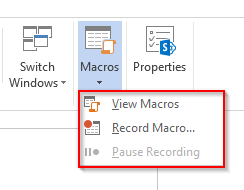 Today’s quick tip will focus on how can run our macros with a simple button click from the Ribbon. This tip was written for Word, but applies to Excel as well. Microsoft Outlook and PowerPoint don’t have an integrated Macro recorder, so we’ll need to use VBA to write Macros. As such, running Macros in PP and Outlook is slightly different, and we’ll be detailing that in a different post soon. Ok, without further ado, let’s get going. Open Word 2016, click View tab and select the Macros drop-down box. Set the name for the macro and its description . Now it’s time to tell Microsoft Word how you’ll invoke your Macro in MS Word. In today’s guide we’ll opt to assign it to a specific button. Therefore, your next step is to click on the button icon so that your macro can be operated from the Quick Access Toolbar (located in the upper left hand side of your screen next to the Word icon, Save button and Undo/Redo buttons. Now, select your macro and associate it to an entry in the Quick Access Toolbar. Here the default Name and icon will be set to the macro. You can hit the Modify icon to select an icon and rename it. After we set, click OK to add the button to the Quick Access Toolbar. Once done, hit Stop recording. The Quick Access toolbar now displays a button that allows to run your macro.